With the cost of living skyrocketing in areas all throughout the country, many consumers are seeking out cheap, or preferably free, ways to curve their utility bills. When it comes to heating your home throughout the winter months, a wood-burning stove effectively warms your living spaces without burning through your bank account. 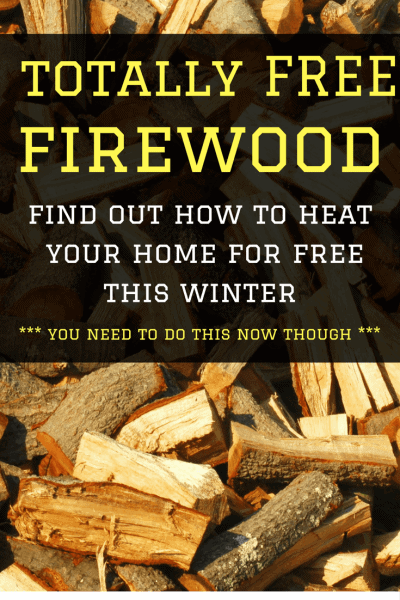 To further deepen your monthly energy costs, stop buying your firewood and turn to these completely free, and completely legal, ways of gathering perfectly good free firewood. Update: We use this method every year now. It is the only method here that we need to use, to get all the firewood we need (for FREE). We simply get the green, unprocessed wood delivered in the spring and early summer. I then saw, chop it, and store it for use the following winter. Most tree surgeons (Arborists) are clever enough to realize that logging, seasoning and selling their hardwood waste is a no-brainer. However, there’s only really any value in hardwood logs, as this is what most people want to burn. This leaves a lot of fresh softwood being wasted or chipped for biomass (that usually just gets taken off their hands in bulk for little or no money). If you are willing to burn softwood (and if it is free then you should be willing! ), it’s not too difficult to find a local tree surgeon/arborist who will be happy to dump loads of cords/tree rings on your driveway for free. This literally is an untapped resource for free firewood! All you need to do is cut it up and season it. Contact some of your local companies and ask. Some will ignore you or say no. Some may offer to deliver loads for $20 etc, but some will also be happy to help you out for free, as it helps them out. We do this and get all the firewood to heat our home for free. As we have built relationships with a few local companies, they also sometimes deliver hardwood loads as well. If they are cutting several trees close to us, it is easier for them to quickly dump loads with us, rather than travel further to their depot each time during the day. At the beginning of this year, we had several large loads of tree rings and branches delivered. None of it was perfect firewood, there was some very wet (but not rotten) oak that had been laying on the ground for sometime and some green sycamore and pine. This was all sawn, chopped and stored to season throughout the summer. We now have more than enough free firewood to get us through the winter, without spending a penny on heating. If you want free firewood, get in touch with local arborists! A note on burning softwood: providing it is well dried and seasoned (which takes half the time of hardwoods! ), and you get your chimney/flue cleaned once or twice a year, there is absolutely no problem with burning pines and other softwoods. Sure softwood burns through a bit quicker, but it is not an issue when it is free! As construction crews clear the land for new developments etc, there may be a significant amount of heavy brush or tree branches left in their wake. While some construction companies sell wood to firewood merchants or lumber yards, smaller branches and brush are often available free of charge as long as you receive permission from the construction manager. It is always worth asking when you see new developments in your area. Every day, there are people in your area giving away waste wood (pallets etc) and wood from trees and bushes they have cut down on their properties. People without wood-burning stoves and fireplaces are only too happy to give their wood away for free, rather than having to dispose of it themselves. All you have to do is go around and pick up the wood. Check eBay, Gumtree and Freecycle and other similar websites, and search in your areas for free firewood and logs etc. Some people will charge a small amount, but most are only too happy to have someone to come over and take it away for them. Often times, dead tree branches are found scattered throughout residential or commercial properties. If you notice dead or even dying, trees lining a property, ask the owner if you can gather some of these branches. In many cases, property owners don’t have the need for the wood, or the financial resources to have the trees removed. Therefore, by gathering these potentially hazardous tree branches you’re not only stockpiling your free firewood supply but also helping out a neighbor. After a major thunderstorm, tree branches tend to accumulate along the side of the road or in yards of commercial and residential properties. While most property owners simply throw away storm debris, ask the property owner if you can help collect and remove the debris with the premise of keeping some, or all, of the wood. If you live in an area that frequently sees windstorms, this could be the sole source of your free firewood supply. Commercial retail stores and warehouses use wooden pallets for a myriad of reasons. While many businesses reuse pallets, once damaged, or once their stock of pallets becomes too large, many are open to donating to local residents for firewood purposes. The size, shape, and portability of wooden pallets make them a perfect source for firewood, especially kindling. Just be sure to check they are pressure treated, rather than chemically treated. Most are these days, but it is better to check. A quick Google of the stamps on the pallets will tell you. Many sawmills actively search for ways to reduce their overhead, which includes disposal costs associated with end cut removal. Contact your local saw mill and ask about pick up times for scrap lumber. While you’re there, don’t forget to pick up a bag or two of sawdust, which may be used as kindling. The sawmill got rid of some waste and you got some free firewood! FREE fuel and unlimited fuel to heat your home – that’s quite a promise! It doesn’t actually promise to be a solution to provide ALL of the fuel to heat your home, but depending on the size of your home it probably could do just that… If you have a small house or cabin heated by a wood stove you could probably heat your house using just this method. For larger homes with a wood fire or stove, this would be an excellent addition to firewood which could possibly save you 50%, maybe more on your fuel costs. You are obviously not going to be able to generate enough junk mail, cardboard and magazines etc to save a fortune (although still worth doing! ), but if you ask friends, neighbors and family to save all their paper waste you’ll start to generate a significant amount of fuel material. You could also ask around local businesses for their waste paper too!